This time of year is a good time to find your own little beach…and maybe something else too! I have an usual method to measure the “ changing-of-the-seasons” here in La Paz. My sure-fire way to know that the warm-weather tourist season has ended is goofy, but simple. I walk outside our Tailhunter Restaurant and use the street as my measuring device. For about 8 months of the year, getting across our main street from one side to the other is an exercise in agility, patience and frustration. The long straight “malecon” that runs along the ocean-front of our city is like a mini-dragstrip. Perfect for parades. Perfect for marches. Perfect to see how fast your car accelerates. Then, about now, it changes. But, it’s a great time to come down. 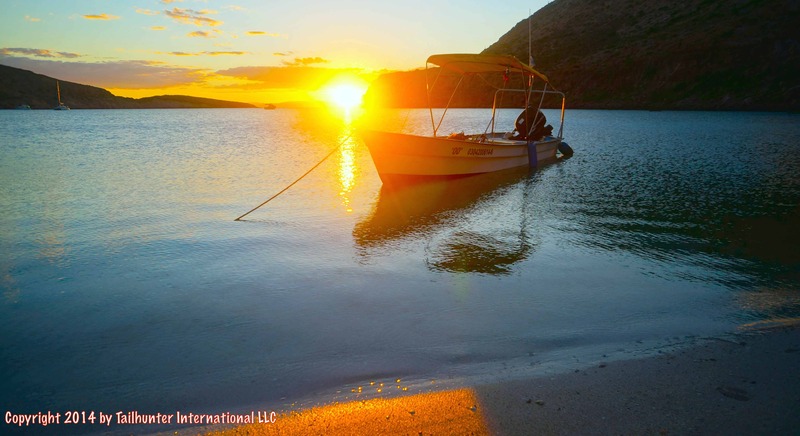 Depending on your perspective, winter is Baja is either warmer or cooler! It’s surely cooler than April to October when the legendary Baja heat sends visitors cranking on their hotel air-conditioning units or spending their waking hours at the poolside swim-up bar. Humidity is nil. Daytime air temps in the 60-80’s are more the norm. You night even use a blanket at night. It might actually be a good idea to pack a pair of jeans or slacks and a sweatshirt! Some areas of Baja actually get “cold” by Baja standards and frost is not uncommon and you’ll see us locals in down jackets and watch caps. Conversely, if you’re from say…the Pacific Northwest…Canada…the East Coast…you’ll find the winter months to be head-and-shoulders over shoveling snow or drying out from rain. You’ll get a grin watching us residents “bundle up” while you saunter down the marina or beach in shorts and send Instagram selfies to your envious neighbors back home while holding icy margaritas. Bargaining for silver jewelry for your wife beats crawling under your car to put on snow chains. Further, as I alluded to above, crowds are down. Be the only ones in a restaurant. The hotel staff call you by name. The bartender remembers your favorite drink. No lines for attractions. Actually find a beach where you’re not dodging beach balls or forced to listen to someone else’s obnoxious boom box. Walk downtown and around town and sit and watch and listen, immerse and discover without a time-share or t-shirt sale dogging your every move. If you plan to fish, winter-time fishing might put a whole different spin on Baja fishing for you. Cooler waters and perhaps windier conditions might predicate completely different types of fishing for you. Winter or inshore species you hadn’t considered like yellowtail, pargo, cabrilla, amberjack and others will surprise you. Shoreline fishing and beach fishing can produce sierra, rooster fish, jack crevalle and pompano and perch. And there’s a good chance the waters won’t be crowded and the shorelines will be deserted! And there’s that aspect again…just not many folks around. And that’s good. There’s opportunities for bargains and deals. Taxi drivers need fares! Negotiate to have a personal driver for all your days. Or negotiate for a better deal with the rental car agents who all work on commissions. Same with tourist vendors. Alway wanted to try snorkeling? Want to do that glass-bottom boat thing? Want some horseback riding or try that off-road ATV? Ask for a deal. Winter is the perfect time. Bottom line is that often you’ll see a whole different side of Baja and Mexico during the winter months. Even for frequent visitors who usually only show up during the peak warmer months, they find a completely different complexion to their favorite Baja locations this time of year. For many it becomes a favorite. And a hidden secret they sometimes aren’t eager to share lest the crowds come back!